Halifax Correctional Unit is a level 1 minimum security facility that opened in 1955, and houses a maximum of 248 male inmates. The facility is consists of eight housing units and a segregation unit. The visiting and education annex is located next to the main facility. Segregation inmates are housed in cells, general population is held in open dormitories. Halifax Correctional Unit operates a textile industry which manufactures clothing and sheets, and employs 48 inmates. 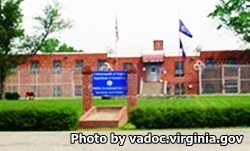 This correctional institution also has three large greenhouses and a crop field that encompasses over ten acres. Additionally, an agriculture meat production operation allows the inmate to work with Boer Goat. Halifax Correctional Unit offers inmates GED classes and quarterly testing. Offenders are provided medical, dental and mental health services while incarcerated. The substance abuse treatment program called "MATRIX" is provided at this facility. Pre-release programing at Halifax Correctional helps prepare offenders for their upcoming release and gives them the skills they will need to transition back into society. Visitation at Halifax Correctional Unit occurs on the weekend and is based on a rotating schedule. Due to this facility using a rotating schedule you will need to contact the facility for the current visiting time for your inmate..